Drones typically add a new layer to RC hobby flight. The machines of old took to the sky without a camera, or they hauled a GoPro to capture footage to watch later. The modern drone packs a camera, sometimes a really good camera, but does more than just capture footage for later viewing. Live streaming video from the sky is a really fun way to experience drone flight. Putting that video in front of your eyes can be done in a number of ways, today we’ll look at the three most popular as we discuss the pros and cons of each. If you need a teaser, FPV is very helpful for orienting yourself in the sky with a camera drone, and all but required if you’re racing around a track. We must start with a warning, something you should already be aware of, most places in the world enforce line-of-sight rules for flight. It is really as simple as it sounds, you must be able to see your drone by eye at all times during flight. 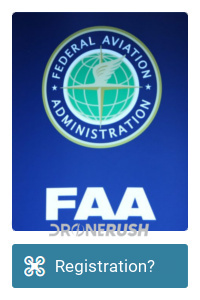 The rule, at least as enforced by the FAA in the United States, has two workarounds to be aware of. First, the rule is only applicable outside, when indoors you may fly without being able to see your drone directly. Notice how many drone racing events are indoors? That’s a big reason why. The second item of note, the FAA allows you to have a spotter. This spotter must stand within audible range of you and they must be able to see the drone at all times. In this way, you can fly your drone from the immersion of a video stream outdoors. Please do not compromise safety for a little bit of fun. I’ll reference those drone racers again, they crash, a lot. Breaking your drone and potentially putting people in harms way is not worth being able to break the line of sight laws. We forgot to mention that some drones handle live stream video differently. In the majority of cases, one camera shares the task of recording and sending the video over live to your display. There are other drones, however, that split the task. 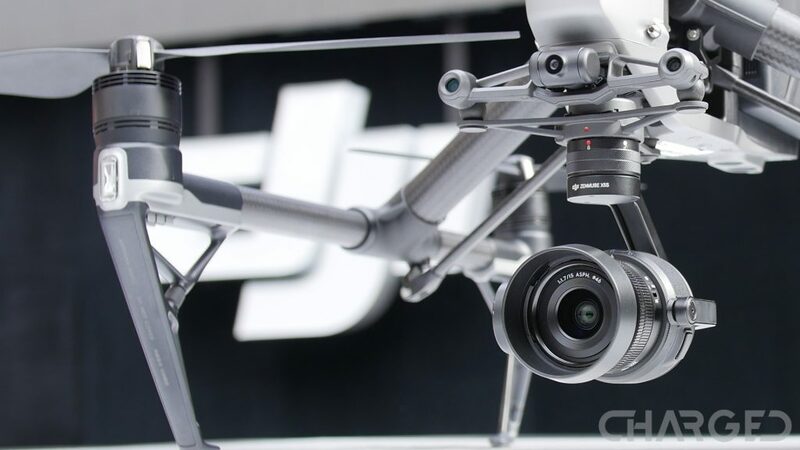 We are mostly thinking of the DJI Inspire 2 and DJI Matrice 200 series drones. On these machines, there is a dedicated simple camera for the pilot, this video stream is still high quality, but is not fully stabilized or loaded with features. These drones are intended to fly with two pilots. One controls the drone itself, the other operates the camera. Having said that, the main cameras for these drones are a collection of impressive shooters. Either way, there’s a video stream coming your way from the drones, how should you receive it? We are going to dive into this list discussing modern and mostly proprietary devices and protocols. Any of you that have flown racing drones likely already know that your typical analog signal on a channel in the 5.8GHz range is different than what we’ll look at today. We will expand on this at a later date, but for now, for the most part, the mobile devices, headsets and external displays we’re looking at below are not the tools you need to race. Look near the end of this article for one diversity receiver monitor that we like, at least. It is entirely likely that if you’ve flown a drone, you used a mobile device either as the controller or as the video streaming screen along with the controller. This is, by far, the most common method to enjoy live drone video. Some remotes have built-in displays. These types of displays can often be purchased on their own, allowing you to use them in place of a mobile device or mount them somewhere for others to watch along as you fly. These are not, however, very common. Finally, there are goggles. 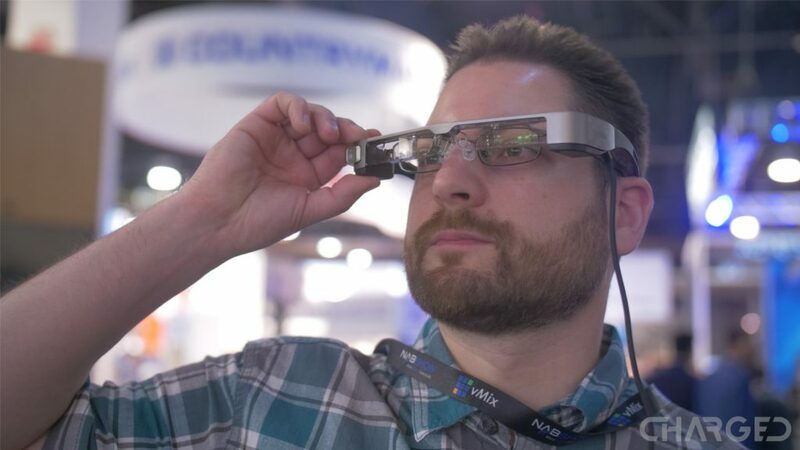 Either AR or VR, like the Epson Moverio smart glasses or the DJI Goggles. Racers will live inside of their Fat Shark headsets. Also, many brands offer their own headset that does not have a display, for these you use your mobile device as the display, but we’ll just pretend that that’s not the case for the sake of our arguments today. The most common video streaming display, as you know, is your mobile device. 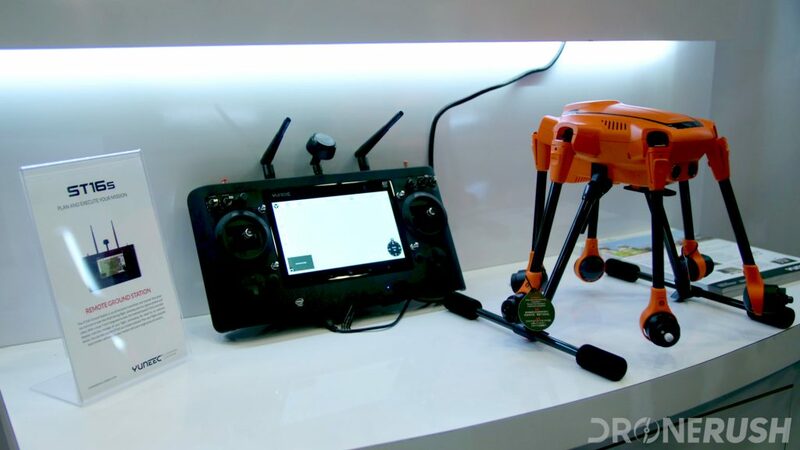 This can be a phone or a tablet and most Android and iOS machines are supported for most drones. Convenience is the name of the game. You are likely already hauling around a mobile phone, why not put it to use? That said, most mobile devices have very high screen resolution these days, which means that the display can keep up with almost all current video streaming resolutions. There is a reason that mobile devices are the most common drone video streaming display. They are convenient and offer you the most flexibility as to the size of display you want to use. However, they are a sort of lazy way to do things. 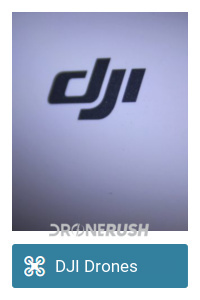 I’m not implying that building and maintaining a reliable mobile app is easy, or cheap, but by not providing a display with the drone remote, a manufacturer saves a lot of money. When a manufacturer provides both drone and display, there is usually a lot more cohesion. The result is far fewer hiccups that are ultimately out of the manufacturers’ control. Having crashed a drone because the video on my mobile device had frozen, well, I’m not over that yet. My little crash (no harm done, by the way,) was a result of the last con for this video method. It’s pretty simple, your drone is in the sky above you, your mobile device and the remote control are in your hands below eye level. You either look at your drone or at your phone. Or hold your arms in the air awkwardly. I certainly wish all of my drones had displays built into the remote, but mobile devices are here to stay. If you need a new Android phone or tablet, be sure to visit our partner site Android Authority. I imagine I do not need to say much here, a display built into a remote control offers little flexibility, but offers no mystery either. Some of these setups will have the display permanently embedded, but some do have mounts on which you can put different panels. Reliability is the name of the game here. Having a display built into your remote control is very convenient, for sure, but offers the most tailored experience a manufacturer can offer. Specifically, connectivity is usually far more reliable than with a mobile device. With a mobile device, you could utilize long cables to put the display up higher or mount it to the side. With a display embedded in the remote, that’s where it lives for good. Aside from the more expensive options out there, we’ve also only ever experienced very low resolution displays, with poor color quality. Don’t get me wrong, for FPV flying, lower resolution and lack of color is not often an issue. The biggest concern with built-in displays is the battery consumption. When you use a phone as the display, if the phone dies, you simply fly the drone home, or keep going if you wish. When the embedded display on your remote runs out of juice, well, you best hope your drone has an automated RTH feature. There are safeguards on may, that turn off the display with enough battery to still fly, but not all, be careful out there. As mentioned, however, not all of these displays are embedded in the remote. 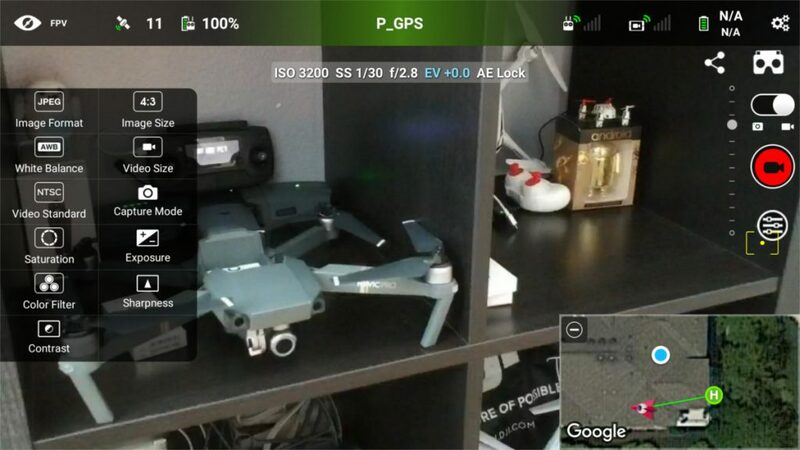 In fact, you can purchase a third-party display that can connect to your drone. In this regard you could mount the display to your remote, or as you’ll see at a production video shoot, the monitor will sit to the side for others to view. These types of displays do not sap remote battery, do not distract the pilot and are usually pretty reliable of a connection, the trade-off is price. 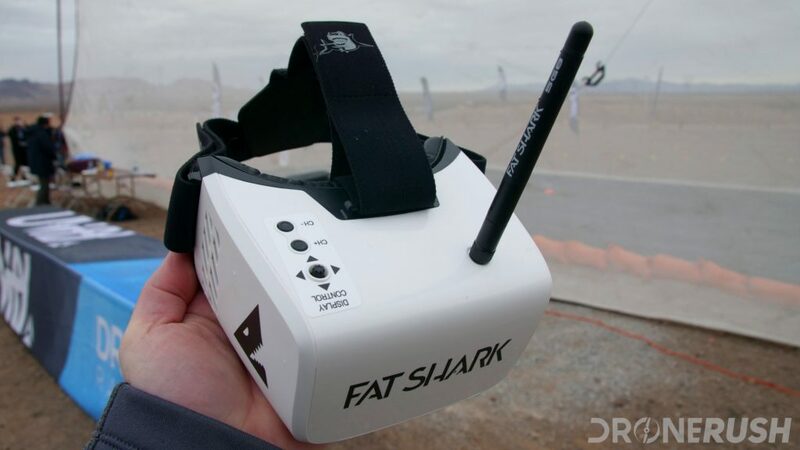 As mentioned, FPV goggles can come in the form of Augmented Reality glasses or as fully enclosed VR headsets. For our purposes today, we will treat them as the same thing, but you should know that they are not. Not really. 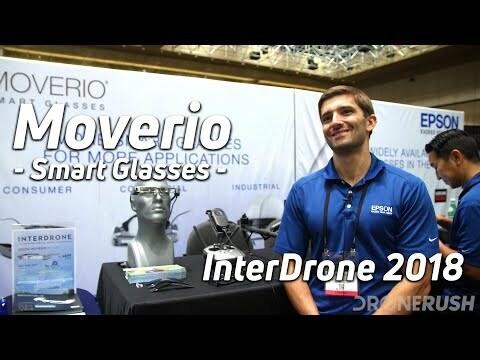 The primary difference, and it’s pretty big, AR glasses do not typically break your line of sight to the drone, so you can wear them and fly. 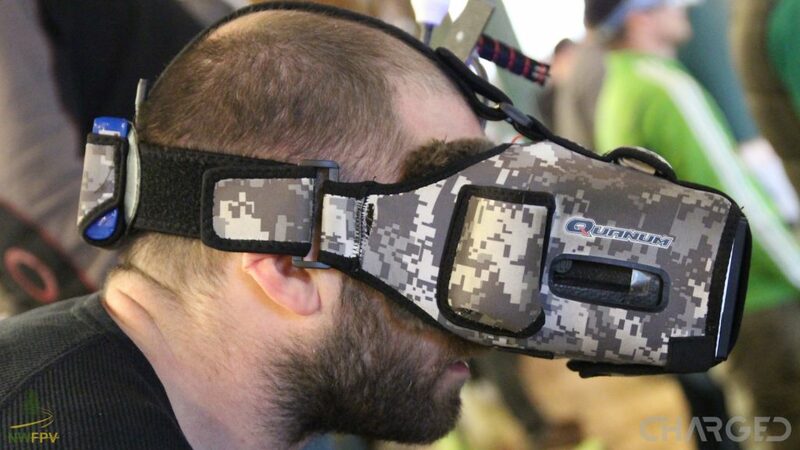 VR goggles are designed to fully enclose, breaking your line of sight to the drone. We’ll explore this difference in detail at another time. For today, both options put the display right in front of your face! The purpose of FPV goggles is really to put you in the seat of the drone. If you’ve never experienced it, I highly recommend giving it a try. Instead of watching your drone from afar, you get to see the world zip by from the nose of your craft. In many ways, it’s like playing a video game, except there is a real world object out there that needs you to do more than hit the retry button if you crash. Requiring a co-pilot to fly outdoors is a huge inconvenience, but usually worth it. The view from the drone is critical for things like racing, making it much easier to remember which way is left when you get spun around. However, when you crash, depending on your orientation, there is no way to tell if you are right side up or what direction you are facing. Getting in and out of FPV goggles mid-flight is not entirely as simple as it sounds. VR goggles in themselves cause a little wooziness for many. Once again, removing the goggles mid-flight can be dangerous. Stopping to faint, fall over or to get sick are, essentially, in violation of FAA flight rules. It’s your job to see a flight through to a safe landing. With all the cons, the pros are really pretty fantastic. As I say, I hope you all get to experience drone flight video through VR goggles. We enjoy the DJI Goggles around here. Truth is, I usually do not have a spotter along, so I fly my route, capture the video then transfer it into the Goggles for later viewing. In this way I can also share the experience with friends and family knowing that the drone is safely on the ground as the video plays. I might also mention that the last family gathering I had like this was over an hour long. The DJI Goggles last upwards of 6 hours on a charge, the Mavic Pro does not. 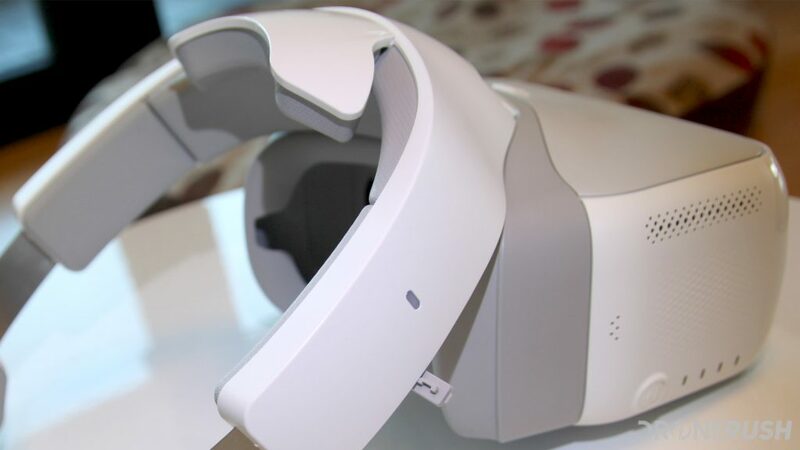 In the case of the DJI Goggles, the display is equivalent to a 216 inch TV sitting about 10 feet from you. You can do the math or imagine what that looks like, but I’ll just say, it’s huge. The display effectively covers your entire visual range. That is a pro and a con in itself – it’s amazingly immersive, but looking from corner to corner definitely pushes the eye muscles to make happen. Finally, in the cons section is the issue of latency. Particularly important for racers, if the video on your display is half a second or more delayed behind what is actually going on with your drone, you probably already crashed. The better the video quality, the slower it is to transmit. The DJI Goggles have a really nice display, but they are too slow to race in the big leagues. You should expect mixed results with various headsets out there. I’ve seen more than a few racers crash their quads then scream about their video locking up. On my end, speaking for the DJI Goggles, again, the video stream to my Mavic Pro is consistently the best video streaming I’ve ever had from the Mavic. Traditional RC connectivity, and new WiFi connectivity efforts are designed to accept interference, and that they do, often. DJI’s Ocusync is a different beast. I know, legally, it has to accept interference, but I’ve literally been in a spot where the mobile device display had long ago froze up, the remote was throwing warnings of interference, but the HD video to the Goggles was perfect. I can’t explain it, I don’t know the tech on the inside, but certainly some good and some bad out there. We talked about how the DJI Goggles might be too slow for your racing needs, well, DJI changed that with the new Racing Edition headset. 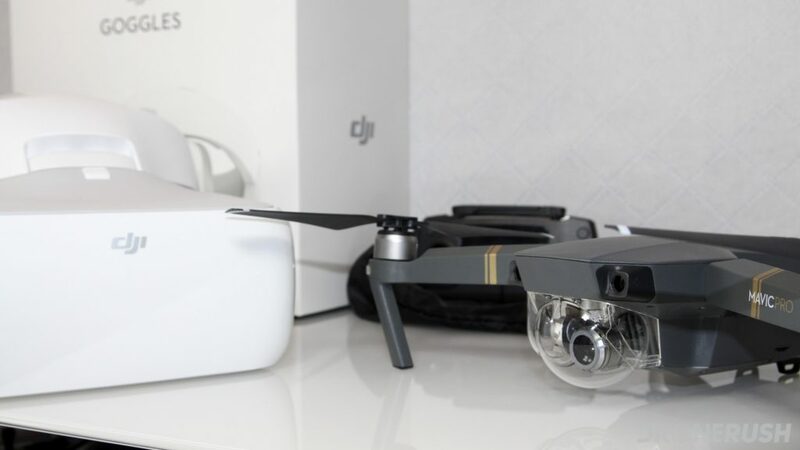 The DJI Goggles RE have a new paint job on the outside, then on the inside they pack better radios, new camera and antenna for your drone, and rock 50 ms latency, which is much faster than the 110 ms of the original. 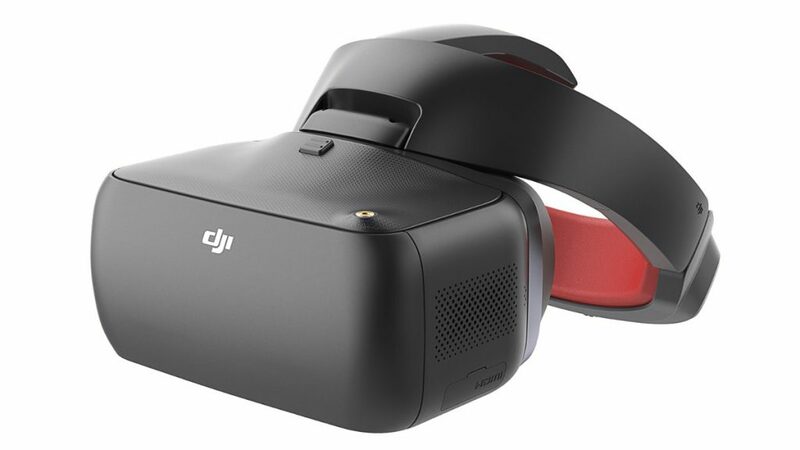 Check out the DJI Goggles RE announcement for more details. 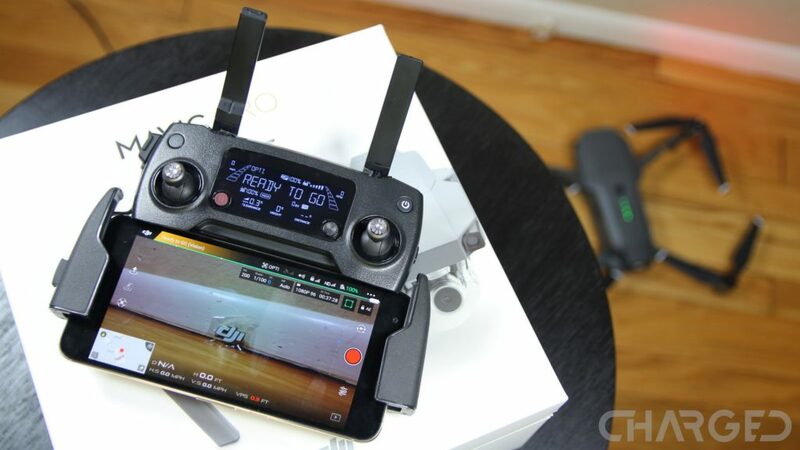 We attached the Osmo Pocket to a drone, and it was good. We began seeing video disruptions at a little over 100 feet, but the Osmo Pocket is a 3-axis stabilized camera that produces video of quality somewhere between the Mavic Air and Mavic Pro. The live video stream goes to your phone, through the DJI Mimo app, but it’s early days, we’ll see if third party support is in the pipeline. Not too bad for $349. Preference is the name of the game. I could tell you that one of these tools is better than another – actually, I sort of did, but that’s not the point – what it really boils down to, what do you want? Laws and your type of flight may help make this decision, but some of you like using a mobile device, others can’t be bothered to look down. I hope that I’ve given you enough info above that you can make an informed decision moving forward. We will be exploring some of the best options to be found in each of these categories as soon as we can. For now, know that there are some fun options. What is your preferred drone display? The DJI Goggles, as noted above, are a great accessory for your DJI Mavic Pro especially, but are fun for more than drones. Do check out the review for more info, or grab the headset for $319 today. The regular price is $449. The DJI Mavic Pro, and now the Mavic Pro Platinum, is the drone that the DJI Goggles were built for. 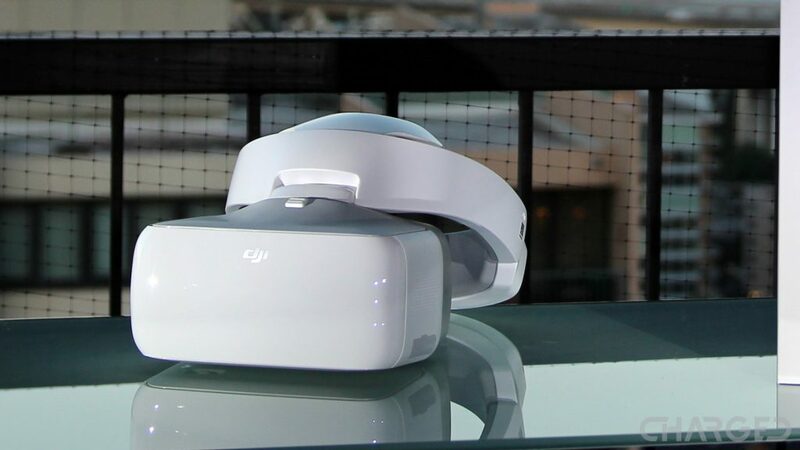 If you were looking for the full VR headset experience with an easy to use, out-of-the-box pair of goggles, the DJI Goggles are hard to beat. 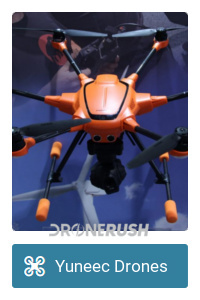 They do so much more than just fly drones with you and can be yours for $449 today. The drone, on the other hand, is still one of the most versatile, portable and capable drones around. There are better machines in each individual department, but none that strike this balance. The DJI Mavic Pro Fly More bundle is $1,129 today. Regular price is $1299, and you can often find the bundle for $999. 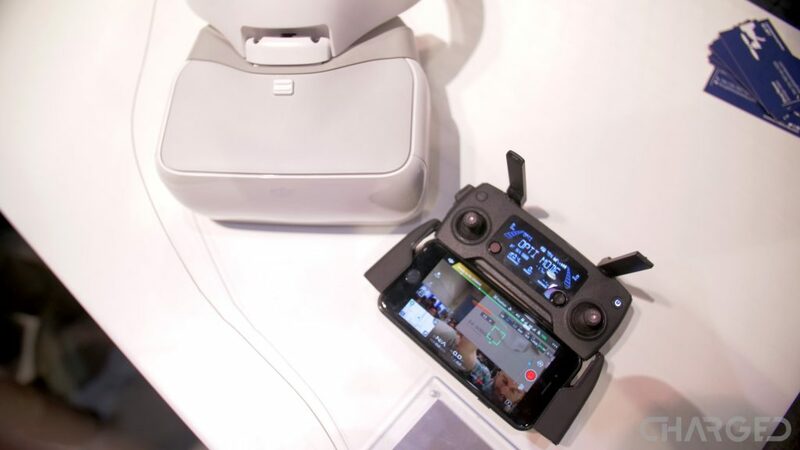 The original Mavic Pro may have inspired a culture of folding drones, but the newer DJI Mavic 2 Zoom and DJI Mavic 2 Pro are the impressive iterative updates to the design. OcuSync is the real story here, bumped up to version 2.0 with the newer drones, you are looking at HD video signals that remain crisp and smooth well beyond reasonable line of sight flight. The DJI Mavic 2 Zoom is $1,1249 and the DJI Mavic 2 Pro is $1,449. 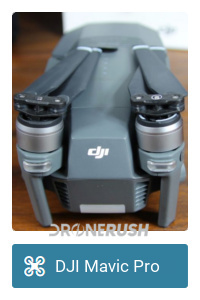 Simply the best drone you can get for six grand. A high speed, highly capable machine that can equip the new Zenmuse X7 camera, ready to capture 6K video for your professional video shoot, or just for fun, if you’ve got that much cash laying around. 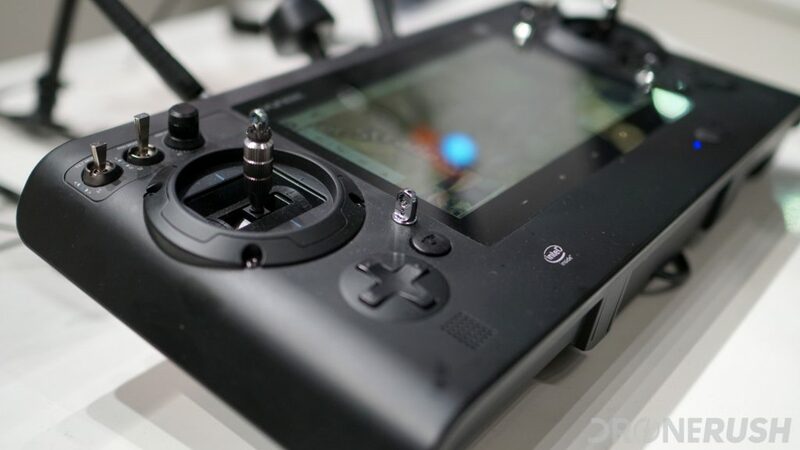 As the drone with the Cendence remote control, you’re packing either the 5-inch or the 7-inch panel into the remote. Not to mention the HDMI out so you can put that video pretty much anywhere. Check out the DJI Inspire 2 for $4,299 with X5s camera today. Built mostly on the same platform, the Yuneec Typhoon H is the consumer drone, the H520 is the pro drone. The Typhoon H comes with the ST16 remote control, packing an Android powered OS and 7-inch display. 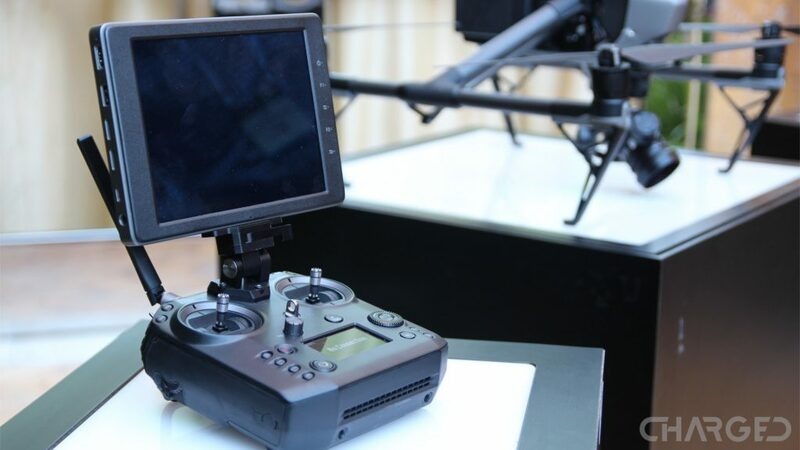 The H520 uses the newer ST16s remote control, which is all the same as far as the display goes, but packs further connectivity and functionality for different flight needs. 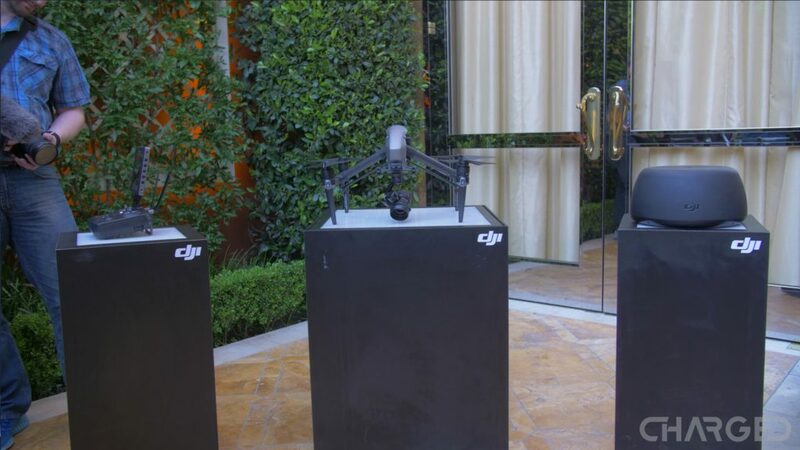 These are hexacopter drones, providing stable flight with redundancy of props in case of a failure. Grab the Yuneec H520 for $1999 for the drone, then add on a camera for about $1200. Alternatively, grab the Yuneec Typhoon H for as little as $799. But, that’s a refurb price, $899 for new. 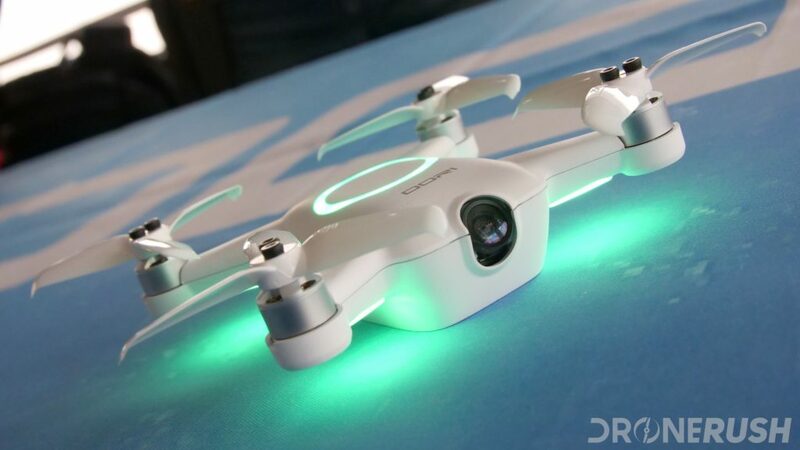 Taking their racing platform and down-scaling it to a drone that is safe to fly indoors, if you wish, the new Uvify OOri offers two of the three streaming video options we talked about today. There is a display built into the remote and the machine can connect to FPV goggles. 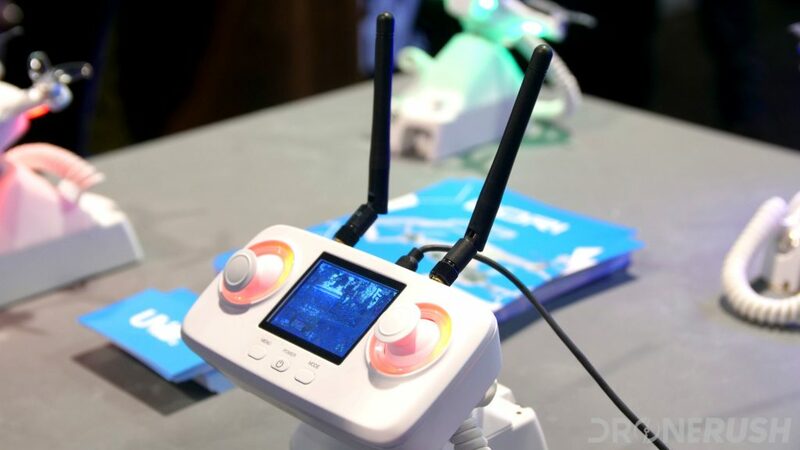 We can’t wait to get our hands on this versatile little drone when it starts shipping in May. Update: We have been flying OOri around the house, it’s tons of fun, and super fast. Check out the Uvify OOri for $345 today. May I speak frankly? Good, thank you. I had had this diversity receiver, 7-inch FPV monitor in my Amazon cart for quite some time, and only just purchased the Eachine LCD5802D this past month. The monitor pulls triple duty, or more, depending on your needs. As an FPV monitor, the diversity receivers pull double duty to ensure the best video feed possible. As a DVR, whatever you see on the screen can be saved to microSD card, photos or video at up to 800×480 resolution, depending on your camera source – my current camera is 720×480, so that is the resolution of my saved files. 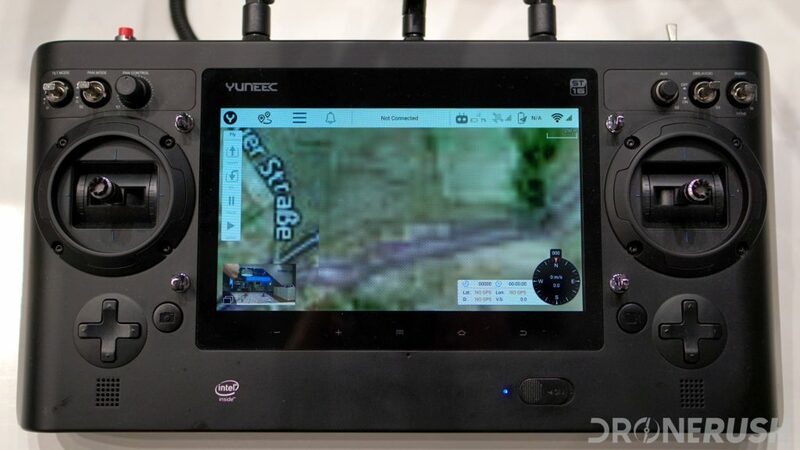 The AV out means you can connect your FPV goggles to the tablet as well, enabling that VR headset racing experience. The AV input means you can use this unit as a screen for your other video receivers as well. Perhaps the best feature is the built-in battery. Not all equipment of this sort is self powered. As far as all-encompassing equipment goes, I’ve not found anything comparable near this price point. There are plenty of machines that can outperform this Eachines monitor in most regards, but they all cost double or more the price. I’ve tested with several drones, and the supported 40 channels in the 5.8 GHz range does not pickup the video feed from the smaller DJI drones or the GDU O2. It does find the Hubsan H502S Desire. We’ll update if we find any popular off-the-shelf drones that work with this monitor, but for now, it is extremely likely that your racing drone will work. Check out the Eachine LCD5802D for $139 on Amazon today. (Usually $126, watch for sales.) When the Eachine monitor is out of stock, check out this Flysight monitor for $149 instead. That’s it for today, we hope you get the chance to try out the FPV experience with your drone, it’s challenging and a ton of fun.